As with the Alps and most other mountain ranges, the snow will melt on the lower slopes in the warmth of the summer sun exposing the rocks beneath it. The Himalayas present the greatest peaks on planet Earth and are the result of the collision of the Indian tectonic plate with the Eurasian Plate. The summer months expose wonderful strata and colour in the rocks though the tallest peaks will still have snow on them. 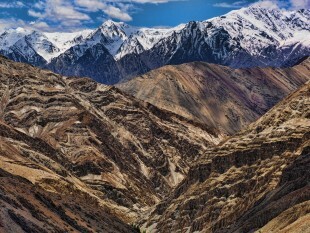 This photograph was taken in the Ladakh region of northern India. 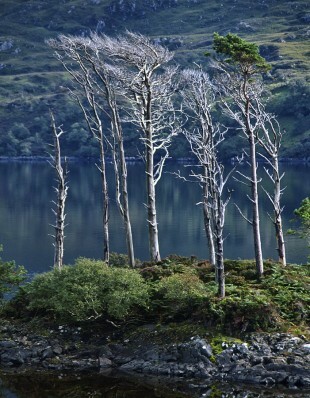 Some trees seem to struggle to survive in this rather bleak and exposed part of Scotland. These trees seem to be doing better than some others. After travelling round the north west corner of Scotland and heading back to our overnight base at Scourie, I looked in the rear view mirror and saw some wonderful evening light on Ben Stack. I pulled over as soon as I could to take this shot. Ben Stack looks a bit like the mountain used in the opening sequence of Paramount films. 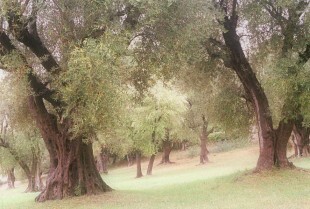 These are the olive trees found in Renoir’s garden at Les Collettes in Cagnes sur Mer near Nice in France. The estate, with its picturesque farmhouse, its groves of olive and orange trees, and the views it afforded of the hilly countryside, provided the artist with inspiration for his later landscapes. 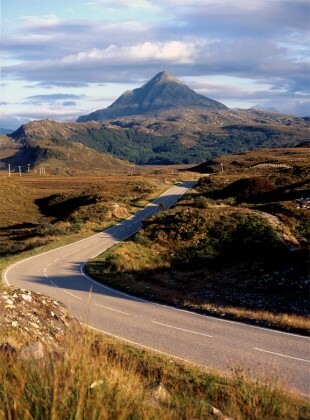 This image has been softened and looks quite painterly when printed on a textured watercolour paper. Taken in Central France. 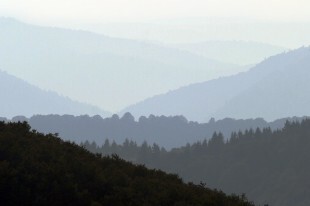 I like the recession and the different layers giving a real feeling of distance in this shot. It’s a little unfortunate that the pastel colours are overpowered a little by the foreground hill. 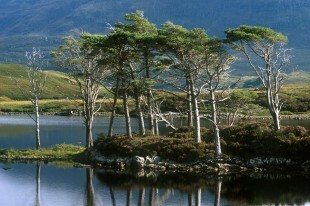 Out in the loch there is a little island with a small clump of trees that seemed desperate to hang onto life. I particularly like the white trunks standing out against the blue/green waters of the loch even though I had to wait a while for the light to be right.